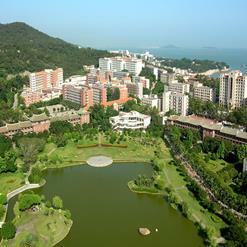 It is a big Buddhist temple outside Xiamen University at Xiada (short for Xiamen University) Street. The mountain is also littered with small enclaves with hundreds of Buddhist statuettes. Entrance to the temples is ¥3, but you can walk around the lotus pond and eat in the vegetarian restaurant on the east end without paying admission.